Femi Kuti was born in London in 1962. He quit school in 1978 to play saxophone in his father's band Egypt 80. In 1986, while Fela enjoyed huge popularity which attracted government disapproval, Femi Kuti took up the pioneer's afrobeat mantle and formed his own group: Positive Force. Over the next ten years he gradually freed himself of his father's musical influence finally achieving full recognition in his own right in 1994 when he signed with the legendary Motown label. His eponymous album, which came out in 1995, established Femi Kuti to a wider audience on the international scene with a more accessible but equally demanding conception of afrobeat. 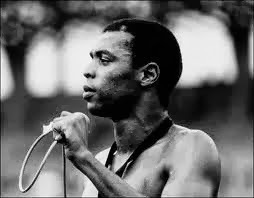 1997 was a tragic year for him, as despite his first professional breakthrough in which he achieved international recognition, it was also the year in which Femi Kuti suffered the loss of his father, and within only months, the death of his sister Sola. Tragedies that would inspire one of the most moving songs from the inheritor of "the Tiger": "97". After two years, in 1999 Femi Kuti brings out a new album on a new label. "Shoki-Shoki" driven by a relatively traditional afrobeat receives public recognition as well as the critical acclaim of his early works. In 2001 "Fight to Win" continues to evolve this development of a democratization and an openness in afrobeat instigated by Femi Kuti since his first album. Containing Nigerian jazz-funk rhythms with a touch of hip-hop, Femi collaborated with American rappers such as Mos Def and Common, and soul singer Jaguar Wright, creating an album of universal critical acclaim. After three years spent between studio work and touring, Femi Kuti seemed to want to look elsewhere and returned to the roots of a musical and political movement of which he is, as of now, the unique symbol and only representative. He decided to invest his success in the reconstruction of a new Shrine, a musical temple, erected, displaced and rebuilt by Fela following repeated attacks against the old ones by a corrupt military power. Just as his father before him, Femi Kuti and his "Positive Force" continue to make of this place a space in which music is the weapon of the future. For this heir to afrobeat it's a turning point. Having achieved recognition on the international scene since the 1990's, Femi Kuti could have chosen to live in a western city such as Paris, London or New York, all cities which have taken him to their hearts. But it's in Femi Kuti's hometown of Lagos, one of the most explosive cities in the world, conceptualised by the Dutch architect Rem Koolhaas, that this descendent of an illustrious line of Yoruba intellectuals has decided to pursue the fight. Femi Kuti was nominated for the second time for a grammy award in 2010 in the world music category proving he is a positive force to reckon with in African and world music.